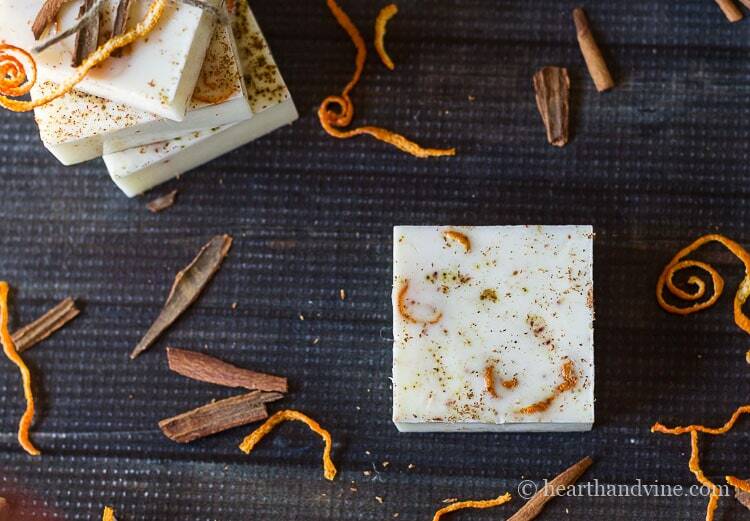 Melt and pour soap with sweet orange and cinnamon oil adds a nice cozy feel to any room. Great for showers, weddings, hostess and helper gifts. Who doesn’t love the smell of oranges and cinnamon? They help give your home a nice cozy feel. That’s why I decided to make a soap with this homey fragrance combination. Since I’m using melt and pour soap, the process is simple. In fact, what you are really doing it taking the soap base, and dressing it up with fragrance, color, and other additives. A super fun creative project, that’s easy enough for the kids to join in on. 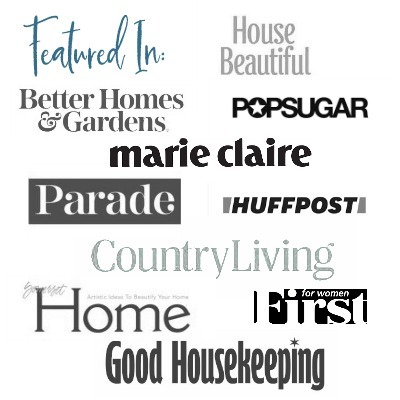 This post contains some affiliate links (that means if you make a purchase after clicking a link, there’s no additional cost to you, but I will earn a very small commission. ) Click here to read my full disclosure policy. Aren’t these orange peels fun? All you need to do is take a garnishing tool and peel the rind around the orange. They will curl up while drying, and you can let the oranges dry out too, to use in another project. Just make sure the orange has good airflow or it may start to rot. Above is a photo of the soap base. It’s soft enough to cut with a knife and melt in the microwave. Start by melting the base in a glass cup for 30 seconds in the microwave and stir. Repeat until melted. This batch took me about 4 times at 30 seconds or 2 minutes. However, everyone’s microwave is different, so yours may take longer or less time. You can also create a double boiler, by placing this Pyrex glass in another pot of simmering water on the stove and melt it that way. By the way, one pound of soap filled this mold with enough leftover to make a couple more bars. Once the soap is melted, let it cool for a couple of minutes before adding fragrance. Pour the melted soap into your mold. Here, I tried to place some of the orange peels in the bottom of the mold first, however, they floated to the top. If you really them to stay on the bottom, then I suggest you place your orange peel in the bottom and add just a little bit of soap to cover. Wait for a while, maybe an hour, before adding any more soap. I didn’t mind the look of the peels floating, so I let it go, and added some ground clove and cinnamon to the top. Let the soap dry for 24 hours before removing them from the mold. Then you can have fun decorating them with pieces of cinnamon sticks and more of your dried orange peel. This melt and pour soap works with many other great scents and botanicals. Lavender, roses, and other citrus scents come to mind. Make it your own and have fun creating these little fragrant beauties. I love your recipes and appreciate the work you do. Just wish the recipes had a prinatble format to make it easier to print out for use. Thanks for sharing! I just added a “Printer Friendly” button at the top of the post just under the title. You should be able to click on it and print the entire article. Let me know it you have any problems. You are a star for sharing these amazing ideas. So glad you like them! The garnishes are perfect you need to open a shop. Take all these neat projects to the marketplace!! Cinnamon and orange is a favorite here just so refreshing. I did have a shop with my sister about 15 years ago. Maybe an Etsy shop is in order? Thanks as always for stopping by! For those of us who have never done this before can you explain further about adding the oils and spices (how much, when to add, etc.) ? Thank you for this comment. I don’t know what I was thinking when I wrote this post. I’m going to update the post but for now, here’s the information. I used essential oils but you could use fragrance oils. Wait a minute or two to let the melted soap cool before adding the oils. I used 3 teaspoons of the orange oil and only 25 drops of the cinnamon oil. This is because cinnamon oil is very strong. I found a handy guide that you can use from a fellow blogger who is an expert in soap making. Here’s her link: https://thenerdyfarmwife.com/essential-oils-for-soapmaking-chart/ For the spices, I used them more for decorative purposes so it’s just a sprinkle and whatever you feel looks good. Hope that helps, and let me know if you have any other questions.